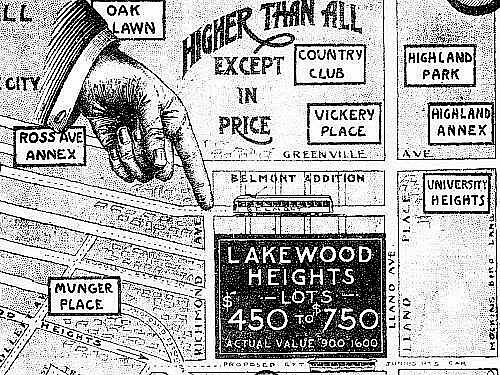 I grew up on Ellsworth, between Greenville Avenue and Matilda — just south of Mockingbird, just north of the M Streets. 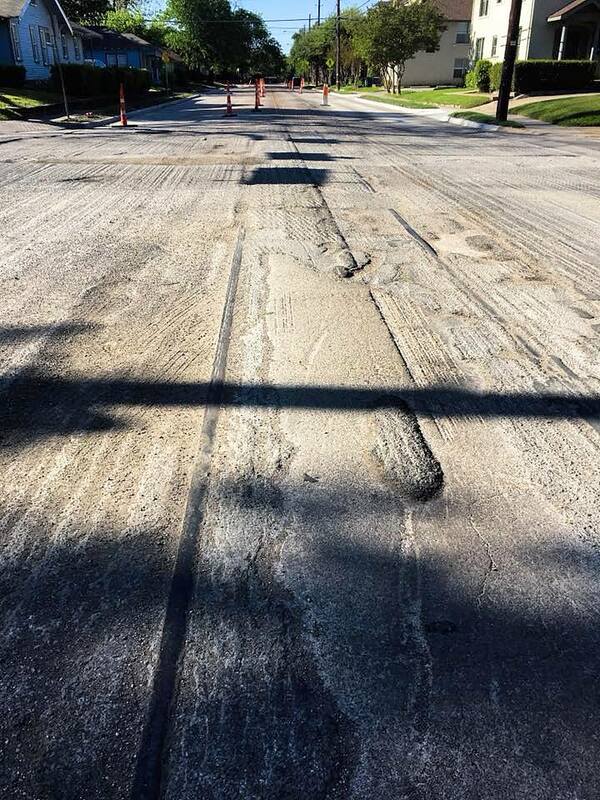 When I was a child, Matilda was only partially paved — in my neighborhood, maybe only from Mockingbird down to Kenwood? Otherwise, it was a dirt street (!) — and this was in the ’70s! Right around Kenwood was a weird mound which might not have looked like much to an adult, but to a child it was pretty strange. I can’t remember if the rails were visible — I’m pretty sure they were. That line was the Belmont Line, which ended (began?) at Mockingbird (I think there was a later extension of sorts, but I think Mockingbird was the end of the line for streetcar passengers). As a kid, I knew that Matilda had been a long-gone streetcar line, but never having seen a streetcar outside of a movie, I couldn’t really imagine what it must have been like to have streetcars (and an interurban! — more on that below) moving up and down a street which was less than a block from my house. Above, a screen capture from the video showing Matilda looking south from just south of Mockingbird. Stonewall Jackson Elementary School is at the left. Today the view looks like this. 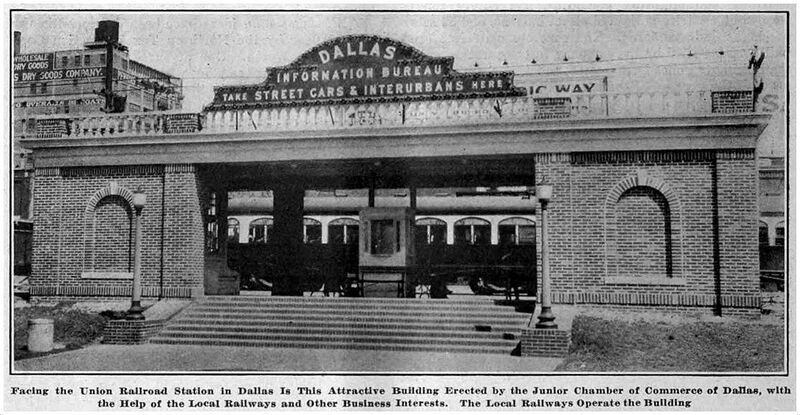 Before the streetcar arrived, Matilda was the artery that led the Texas Traction Company’s Sherman/Denison interurban into Dallas. 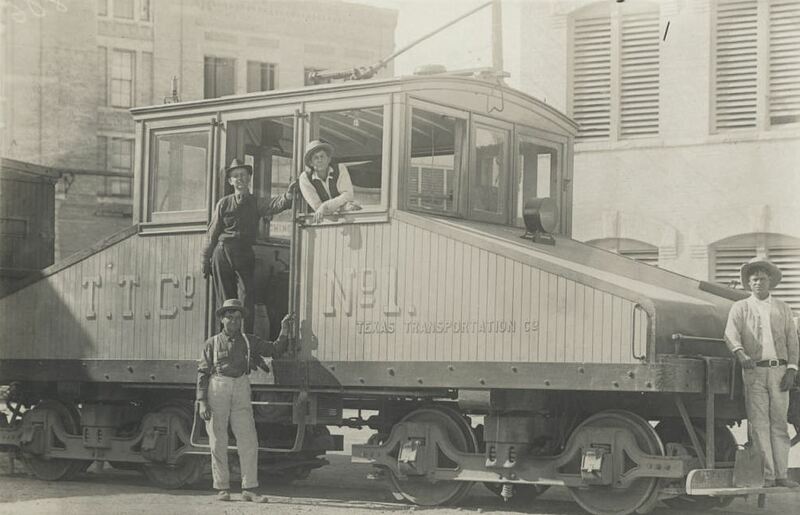 This electric interurban service from the north, which closely followed the H&TC railroad line, arrived in Dallas in 1908, back when the official entry-point into the Dallas city limits was just off Matilda, near Greenville Avenue and Bryan Street. Dallas’ ever-increasing population began to move northward and eastward, necessitating public transportation which would connect these developing areas with the rest of the city. 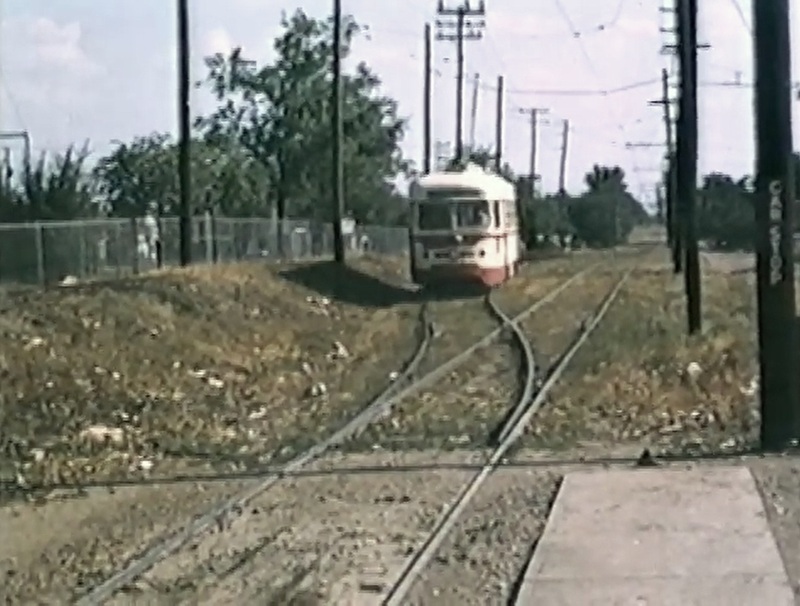 One of the early “suburban” lines was the Belmont Line, which branched off the Bryan Street line and served the Belmont Addition and beyond; it opened in 1913, but these early days appear to have been more of a private “dinky” service (see SMU’s dinky car on the beyond-the-city-limits tracks at Hillcrest and McFarlin, here). The Belmont line — as well as the Vickery Place and Mount Auburn lines — became part of the city’s official streetcar system in 1922. Before the dinky service, riders were able to get on and off the large interurban cars at stops between Mockingbird and the area around Bryan and Greenville Ave. Even though interurbans and streetcars were able to travel on the same rails, it took years for dedicated streetcar tracks to be laid along Matilda. 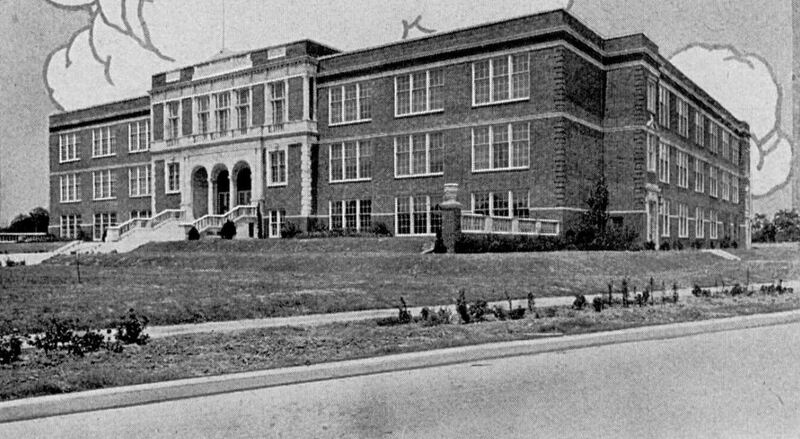 By 1922 the Belmont line had extended north to Velasco; by 1925 it had gotten to McCommas; by 1936 it had made it up to Penrose; and by 1939 it had finally reached Mockingbird (in time for the opening that year of Stonewall Jackson Elementary School, located at Mockingbird and Matilda). 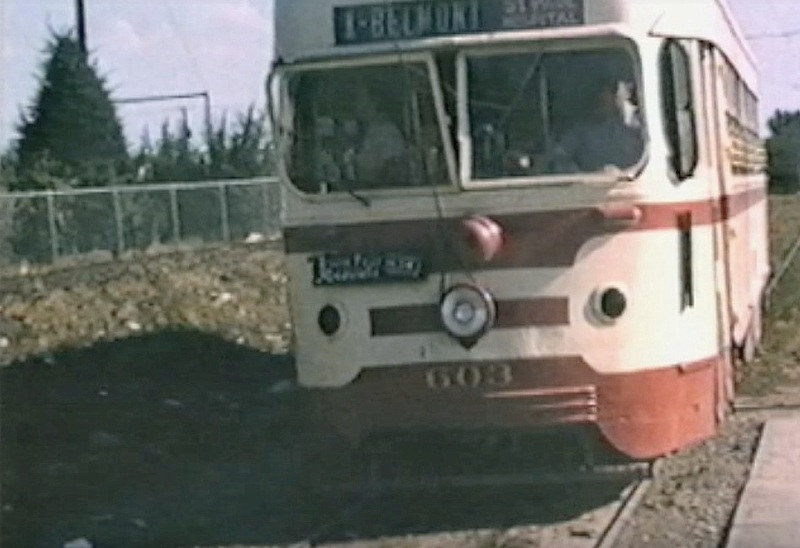 Dallas streetcars began to be phased out in 1955, and the Belmont line was one of the first to go — its last run was March 6, 1955: “The Belmont-Seventh streetcar line will go out of existence Sunday to be replaced by service with new Diesel buses” (Dallas Morning News, March 6, 1955). The new bus route in the Lower Greenville area would, for the most part, be along Greenville Avenue, one block west of unpaved Matilda Street. In March, 1955, it was reported that the abandoned Belmont-Seventh streetcar tracks were deeded to the city by the Dallas Railway and Terminal Co., with the understanding that they would eventually be paved over. The tracks were on Matilda, Bryan, Cantegral, Live Oak, St. Paul, King’s Highway, Edgefield, Seventh, Bishop, and Colorado. In April, 1956, it was reported that the City Council had approved the sale of the streetcar viaduct over the Trinity River and the Matilda street right-of-way. I’m not sure when that paving finally happened — early ’70s? — I think it must have been done in stages. I don’t remember a time when the stretch between Mockingbird and Kenwood wasn’t paved, but I do remember Matilda being a dirt road south of Kenwood. I don’t have a good recollection of the year, but kids remember all sorts of weird things, and those mysterious mounds were pretty memorable. (UPDATE: See photos of Matilda being paved at Goodwin in 1971 here.) I wish I’d known what an interurban was when I was a child. That would have made my neighborhood seem a whole lot more interesting! Heck, it used to the Gateway to Sherman! I’ve long despaired of having missed the streetcar age. But it’s nice to know that one ran so close to the house I grew up in. YouTube video shot by Gene Schmidt in 1953 and 1954; the direct link is here. Another interesting video on YouTube was made by the City of Allen and contains period footage of the interurban that served North Texas. It’s a breezy 6-and-a-half minutes, and it includes some cool shots of Dallas. 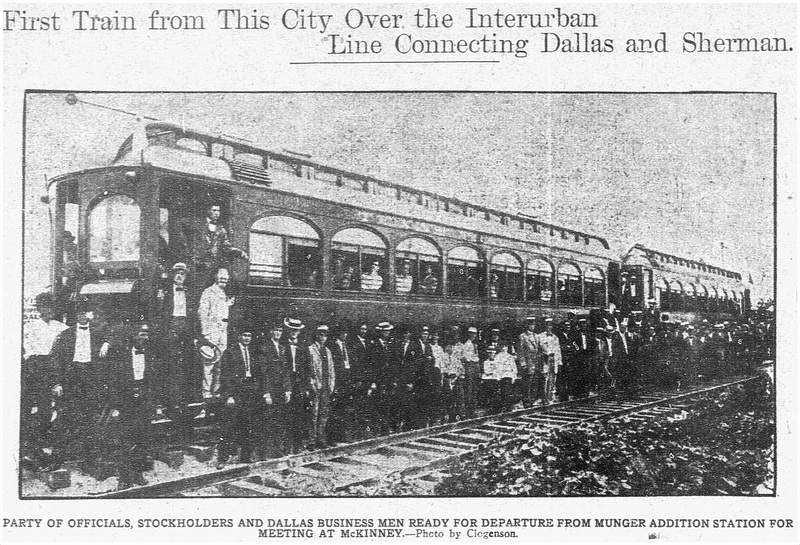 If you want to see a whole bunch of North Texas interurban photos, check out this great 83-page PDF compiled by DART, “History of the Interurban Railway System and Monroe Shops,” here. Speaking of DART, they posted a cool 1925 map of streetcar and interurban lines, here — click the map to see a larger image. (In 1925, the Belmont line ended on Matilda at McCommas). ALSO extremely cool is a Google map showing Dallas’ Historical Streetcar (and Interurban) Lines laid over a present-day Google map, here. Zoom in and out. Very useful! Click pictures and clippings to see larger images. The sanitarium was opened around 1923 by Mrs. Lillie Perry (1876-1929), a woman who might have had some personal experience with the “fallen women” she cared for, as it appears she might have had a child out of wedlock herself. 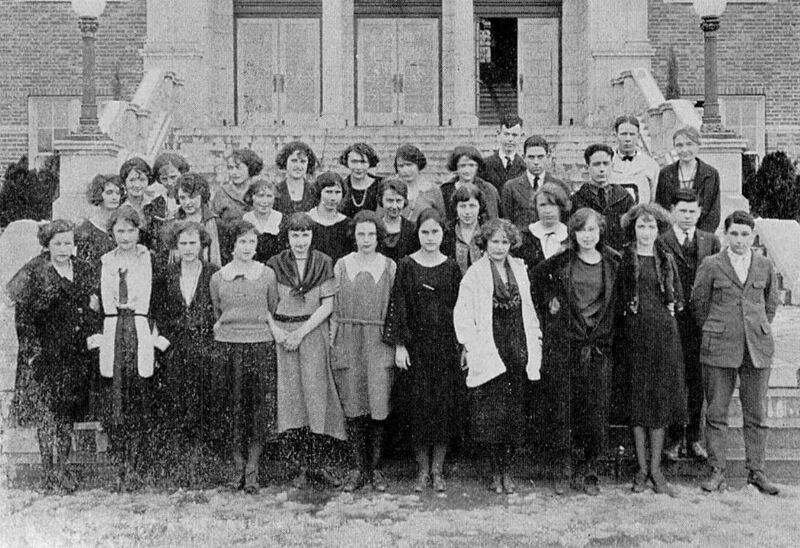 When she died in 1929, her daughter Lillian Hanna took over the running of the sanitarium. Lillian died in 1938, and that seems to have been around the time that the home became part of the Volunteers of America organization, which, among its many social services, provided maternity care for women and also assisted in adoption placement. The last mention I saw of “The Cedars” was in 1944. Below are a few discreet newspaper ads for The Cedars which appeared over the years in the “personals” section of the classifieds. 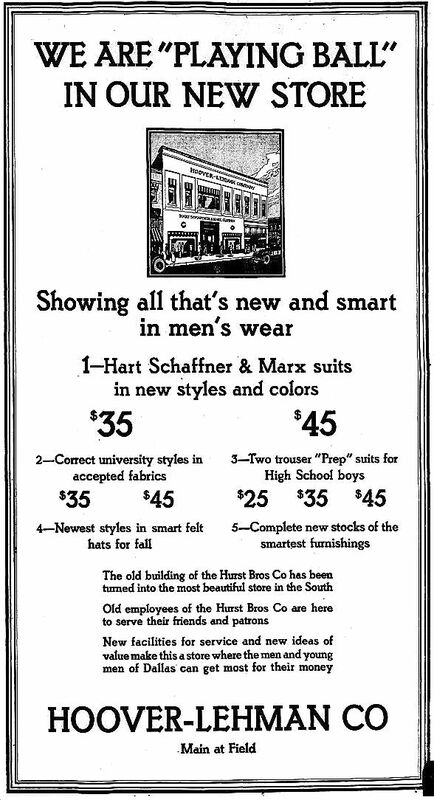 Ads from the Texas State Journal of Medicine appeared in the October, 1933 issue, which can be found scanned in its entirety on the Portal to Texas History site, here. Homes for “unwed mothers”/”unfortunate girls”/”fallen women” were generally places families sent their daughters in order to avoid the social stigma that unmarried girls and women faced when pregnant. They just kind of “disappeared” for several months and had their babies in secret, often feeling pressured to put their children up for adoption. An interesting Salon article on the topic is “The Children They Gave Away” by Sarah Karnasiewicz. 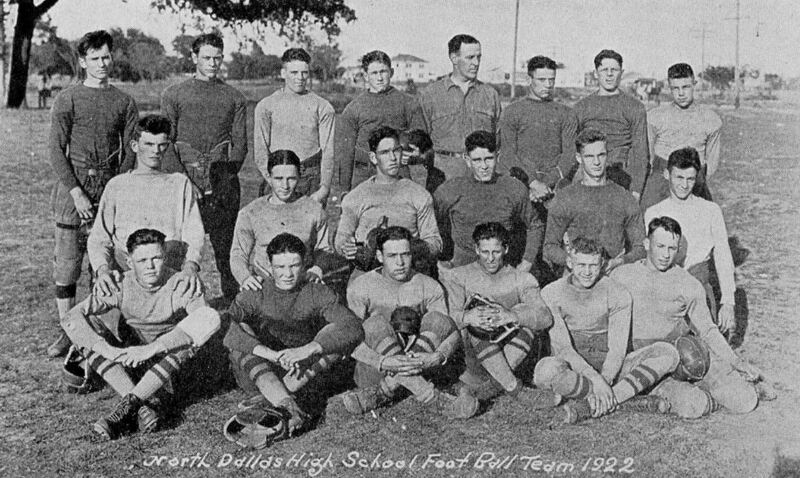 More on the Beverly Hills neighborhood of Oak Cliff can be found in articles from Heritage Oak Cliff and Preservation Dallas. Thanks to Patricia M. who wrote to ask me a question about this place. I’ve learned a lot of interesting things about Dallas I would never have thought to look into were it not for obscure questions from readers. Like this one! Thanks, Patricia! 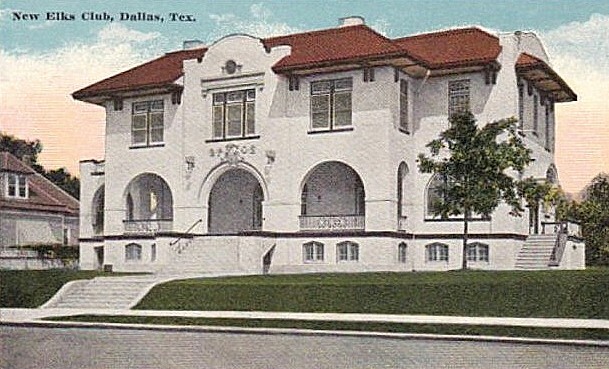 The postcard image above shows the lovely Dallas Elks Lodge No. 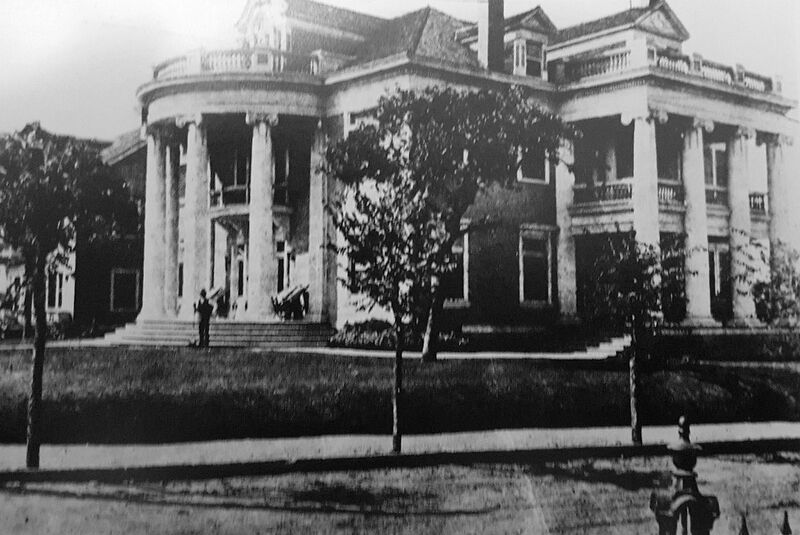 71 which once stood at 1817 Pocahontas, at the northwest corner of Pocahontas Street and Park Avenue in the Cedars area, just south of downtown — it had a spectacular view of City Park, which it faced. 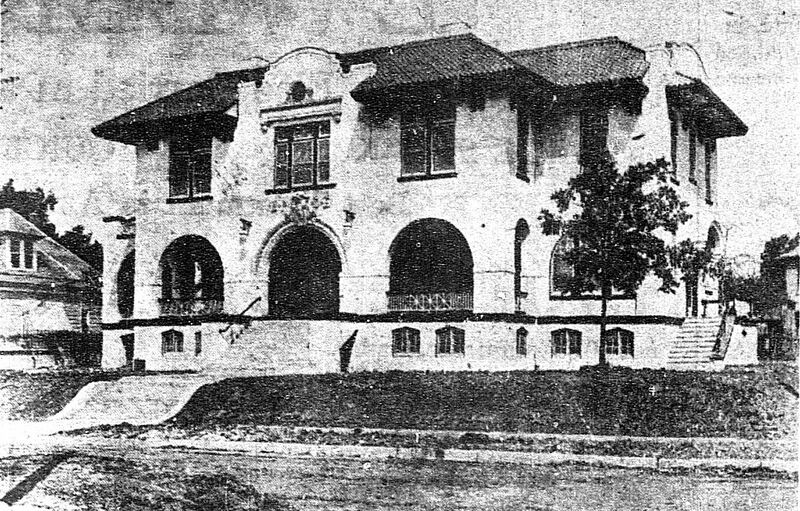 Designed by architect H. A. Overbeck (the man behind the still-standing Dallas County Jail and Criminal Courts Building and the long-gone St. Paul’s Sanitarium), the lodge was built in 1914; the land and the construction of the lodge cost $45,000. Surprisingly, this lodge served the Elks for only six years — they returned downtown, where they took over and renovated the old YWCA building on Commerce Street. 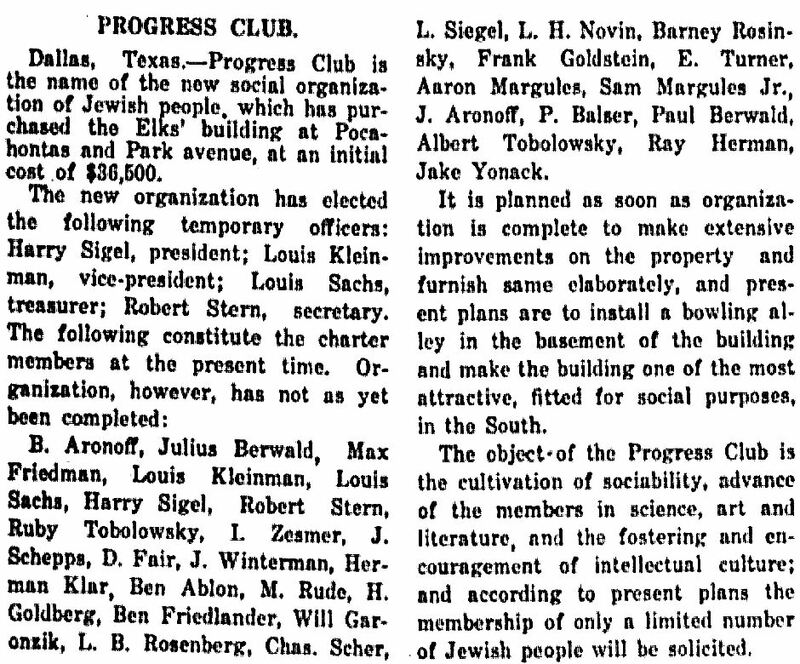 The building on Pocahontas became another clubhouse when it was purchased in 1920 by a group of Jewish businessmen who opened the exclusive Progress Club/Parkview Club (read about the building’s acquisition in a May 14, 1920 article in The Jewish Monitor, here); in 1922 the 65 members of the Parkview Club presented the clubhouse to the Young Men’s Hebrew Association (YMHA). 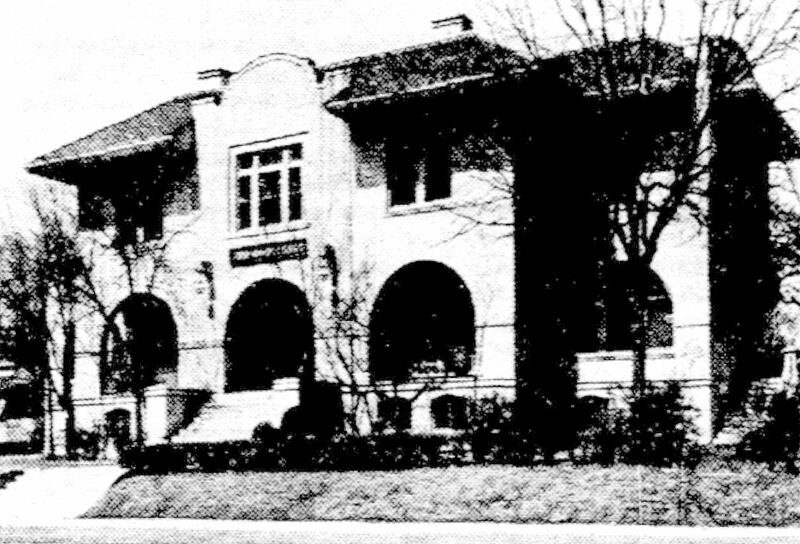 In 1927, use of the building had expanded, and it became the Dallas Jewish Community Center and the headquarters of the Jewish Welfare Federation — in fact, this was the home for these organizations for more than thirty years, until 1958 when the move was made to the new Julius Schepps Community Center in North Dallas. The building ultimately fell victim to the construction of R. L. Thornton Freeway and was demolished in the early 1960s. But back to the Elks. The Benevolent and Protective Order of Elks was a social club/fraternal order founded in New York in 1868. Dallas Lodge No. 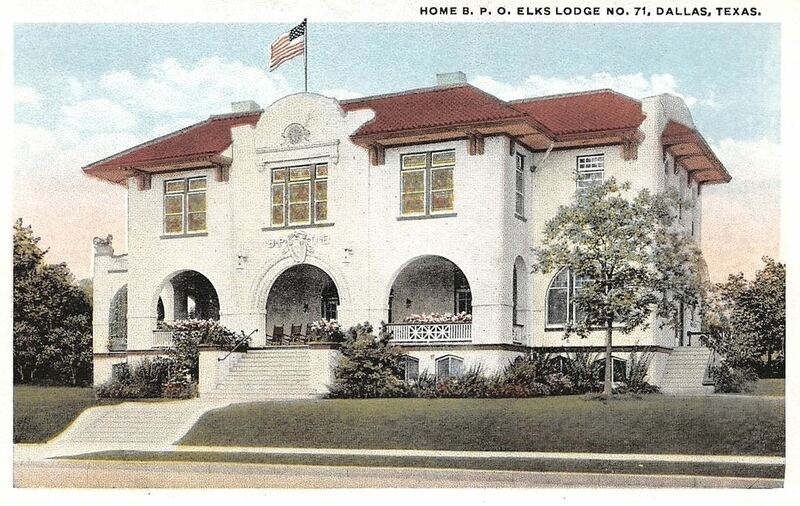 71 was chartered on January 28, 1888 — it was the first Elks Lodge in Texas and one of the oldest clubs in Dallas. And, after 130 years, it’s still around, now located in Lake Highlands. There aren’t a lot of things that have lasted that long in this city! 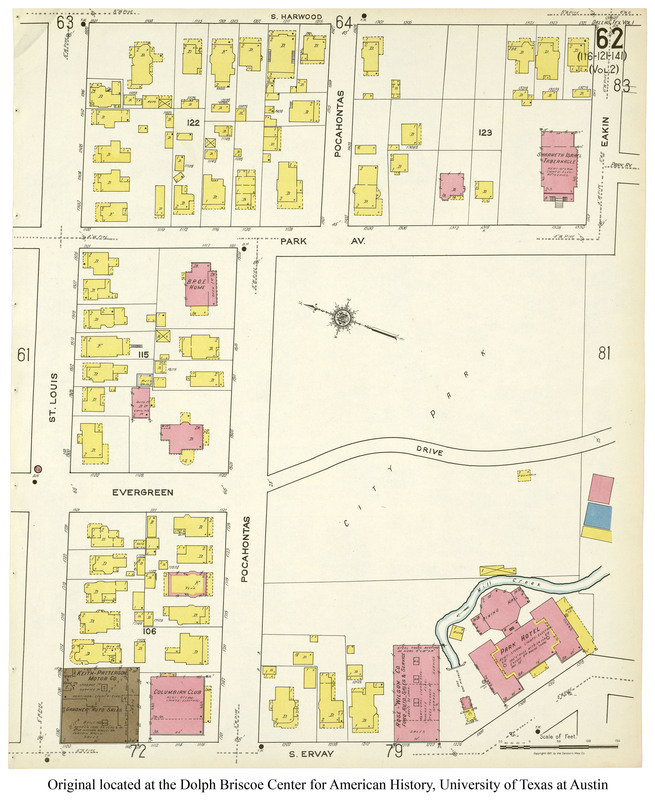 Also, see it on the 1921 Sanborn map (as “B.P.O.E. Home”) here. Source of postcards unknown. Other images and clippings as noted. 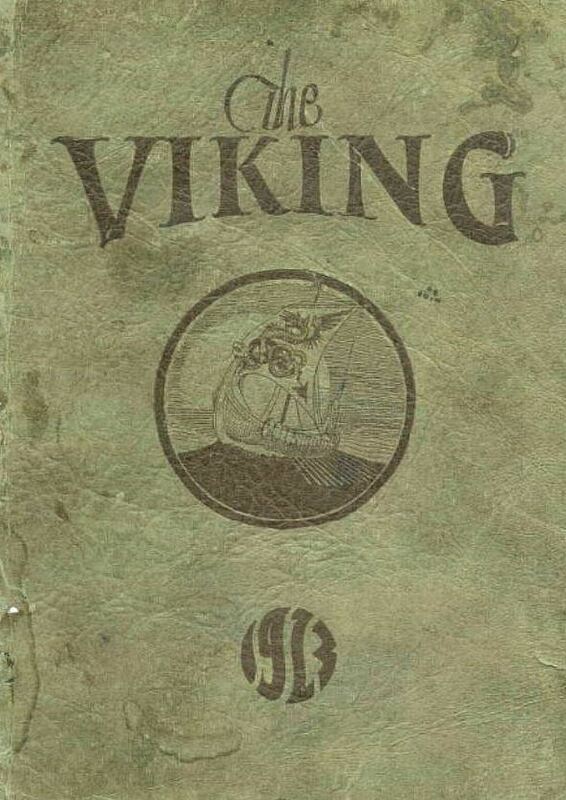 The 1888 report of the first meeting of the Dallas Elks Lodge No. 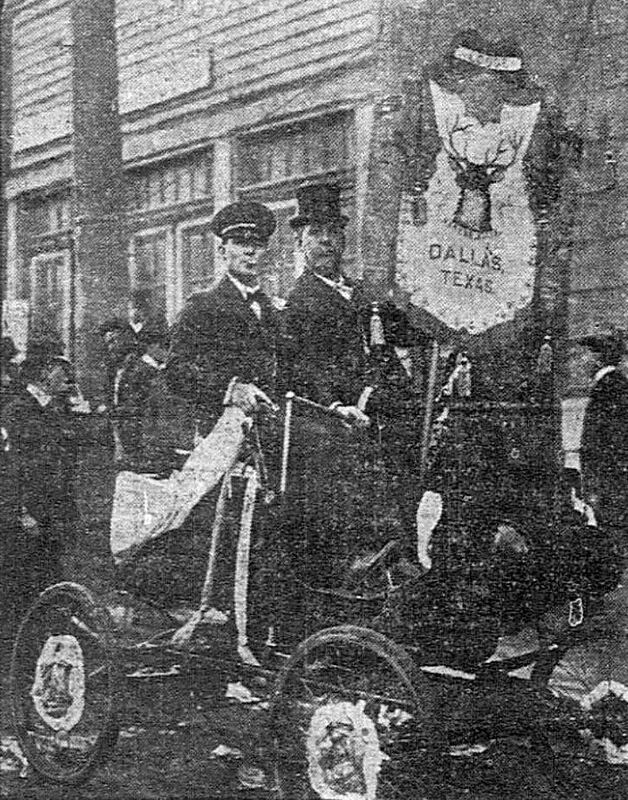 71 can be read in the Dallas Morning News article “Order of Elks in Dallas; A Lodge Instituted Here Yesterday” (DMN, Jan. 29, 1888), here. 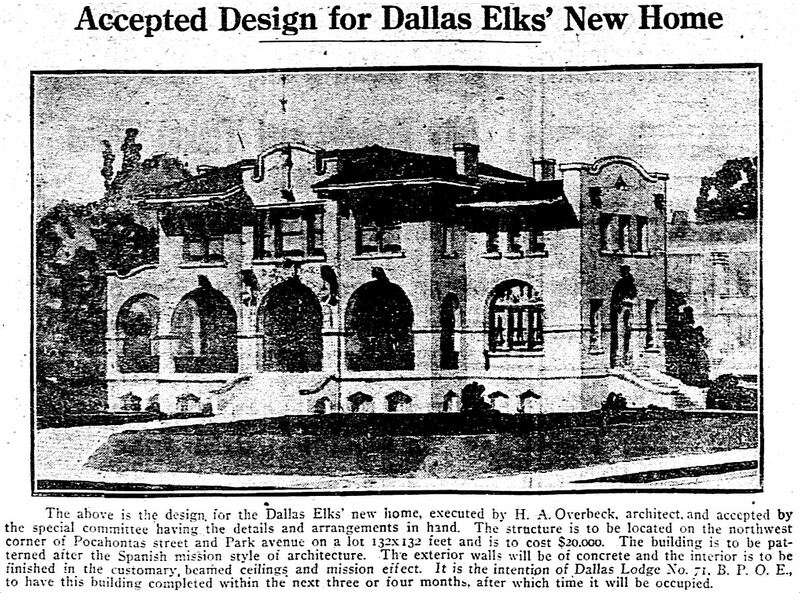 A history of the various Elks’ locations in Dallas between the 1880s and the 1920s can be found in the article “Elks Plan To Have Modern Club Home” (DMN, July 30, 1922), here. This great photo (sent in by reader Erik Swanson) shows Main Street around 1925. 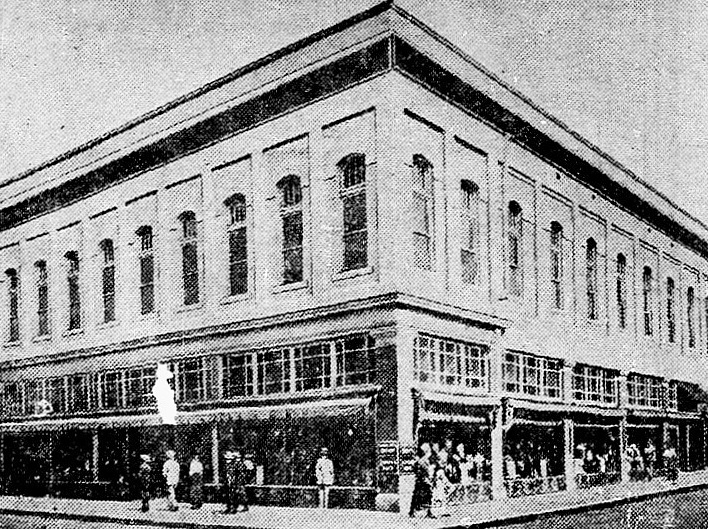 The white building seen in the lower right is Hurst Bros., a men’s clothing shop, which was at the southeast corner of Main and Field (1300-1304 Main). 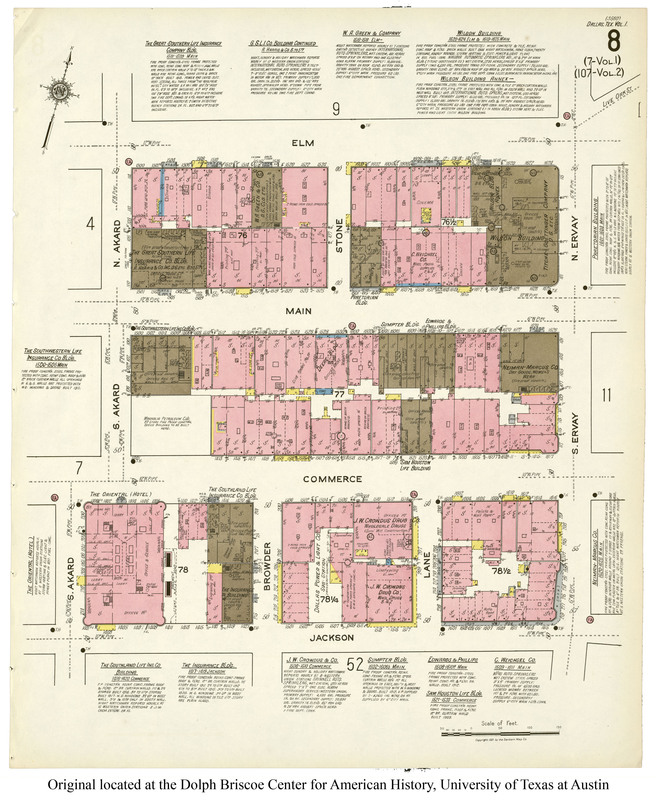 It was a little confusing to me at first because it looks like there is a street behind it (to the south), which would have been Commerce, but then the Magnolia Building and the Adolphus would all be out of place. 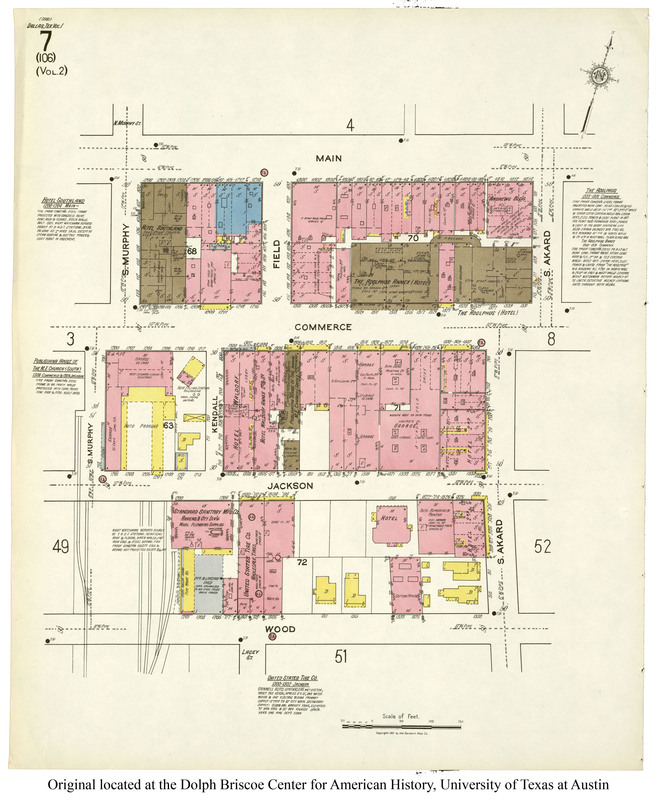 But what appears to be a street was just a wide alleyway/passage (seen on the 1921 Sanborn map here — Main east of Akard can be seen on the Sanborn map here). 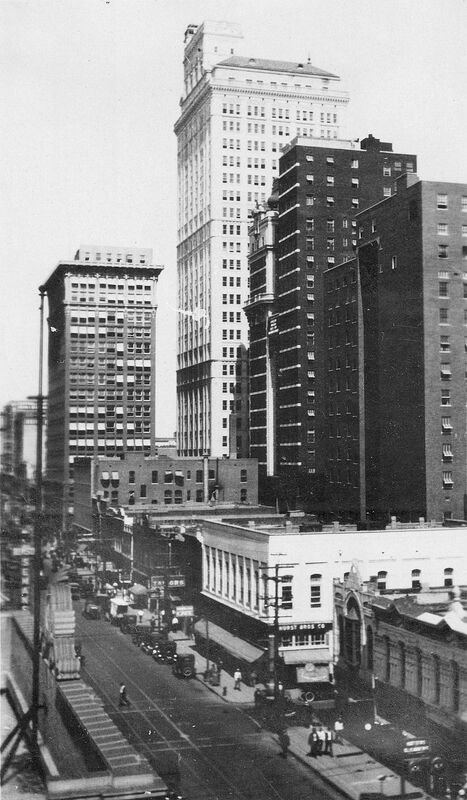 The very tall building is the Magnolia, at Commerce and Akard (it opened in 1922 — Pegasus wasn’t added until 1934); to the right, across Akard, is the Adolphus Hotel and the Adolphus Annex. 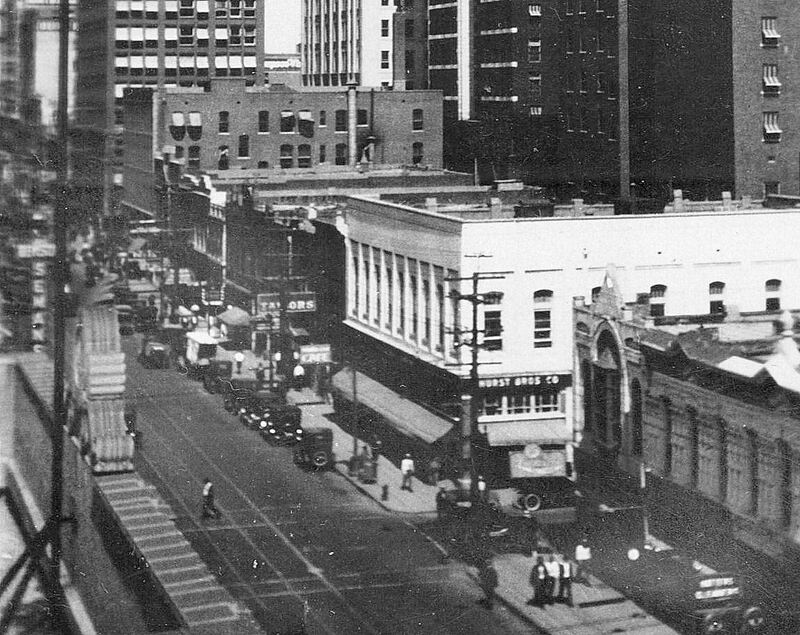 The tall building to the left of the Magnolia is the Southwestern Life Building (southeast corner Main and Akard, demolished in 1972, now a small open plaza area). The 4-story building at the southwest corner of Main and Akard is the Andrews Building. The white building in the center is Hurst Bros. (southeast corner Main and Field), and across Main can be seen the sign for the men’s clothing shop Benson-Semans. 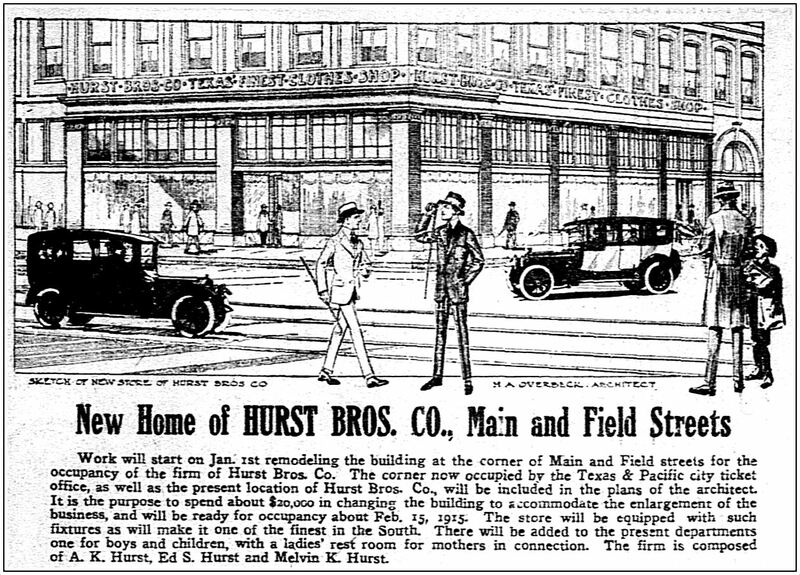 Hurst Bros. was gone by 1929 when it became Hoover-Lehman, another clothing store, and Benson-Semans appears to have vacated that space around 1926, helping to date the photo between 1922 and 1926. Top photo sent in by Erik Swanson, used by permission. 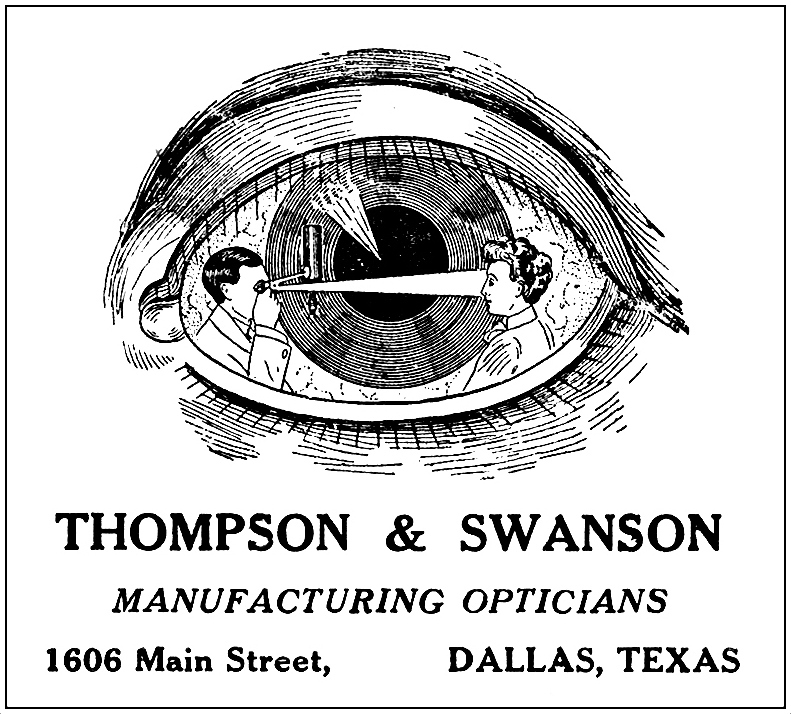 The photo may have been taken by his grandfather, F. V. Swanson, an optometrist (see the post “Thompson & Swanson: ‘The Oldest Exclusive Optical House in Dallas,” here). Thanks for the great photo, Erik! 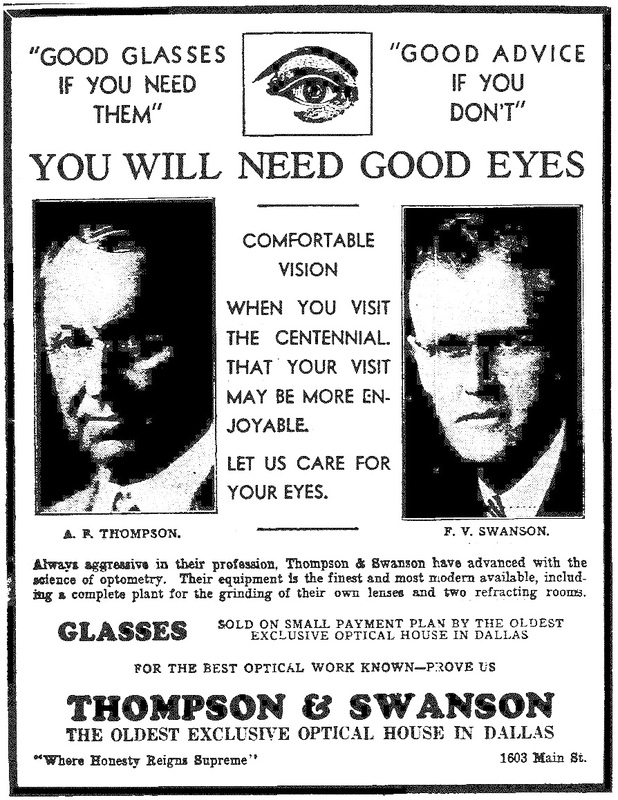 Dr. Alfred F. Thompson (1862-1942) and Dr. Frank V. Swanson (1885-1949) opened their “manufacturing opticians” practice, Thompson & Swanson, in 1911. In addition to examining and treating patients, they also ground lenses and manufactured their own glasses, something which I gather was somewhat unusual in 1911 for such a small practice. 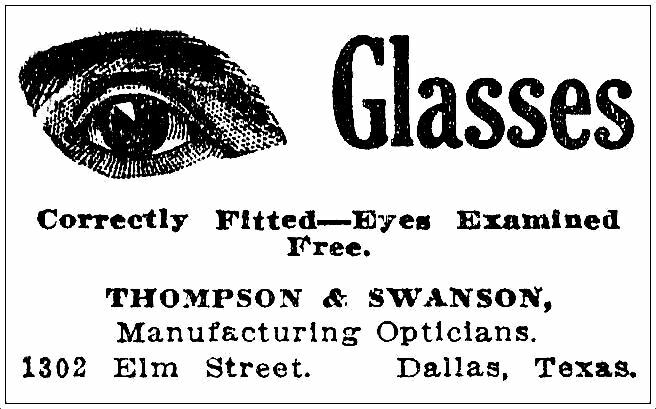 They first set up shop on Elm Street, and their ads — generally eyeball-themed — were always attention-grabbers: not only did they stare at you from newspaper pages, they also seemed to follow you around the room. The successful partnership of Thompson and Swanson lasted into the early 1940s. 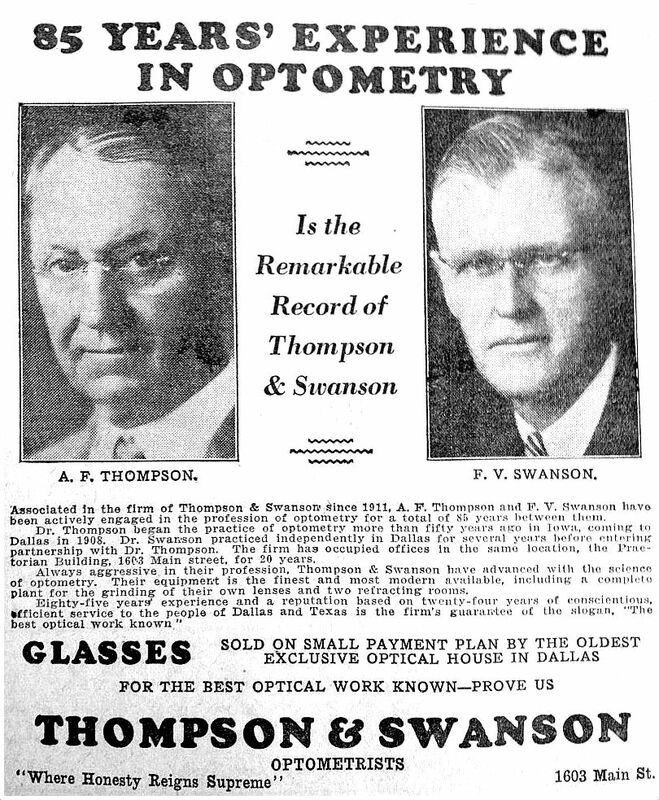 After Dr. Thompson’s death in 1942, Dr. Swanson continued at the same address as “Swanson & Son,” a practice with his son, Dr. F. V. Swanson, Jr. The top ad, the ad with the Praetorian Building, and the “85 Years’ Experience in Optometry” ads were very kindly sent to me by Erik Swanson (grandson of Dr. Swanson); they are used with permission. 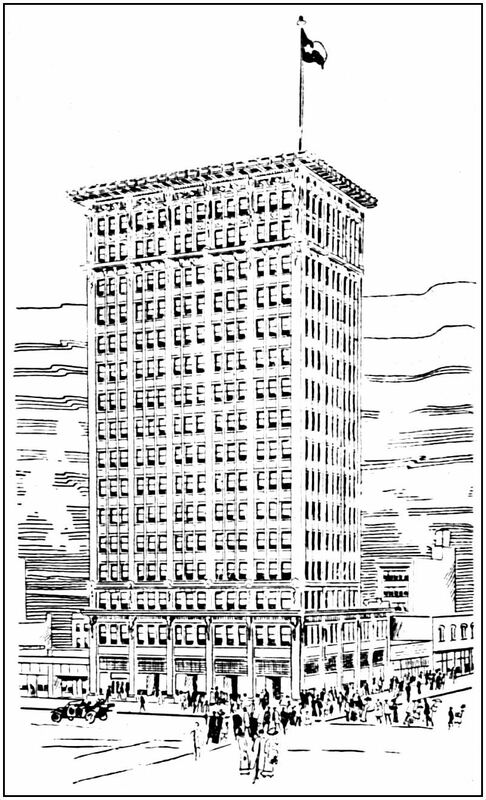 I love old ads, especially ones that feature Dallas buildings. Regarding the location of his grandfather’s business in the Praetorian Building, Erik wrote: “Little did he know there would one day be a giant eyeball at the location where he had his optician shop.” Ha! Now when I see that giant eyeball I’ll think of Thompson & Swanson (and hear that spooky theremin). I was doubly happy to exchange emails with Erik because I’ve been a fan of his Western Swing bands for many years. His current band is Shoot Low Sheriff (listen to them here), but I first became a fan when I heard his former band, Cowboys & Indians. Thanks for the ads, Erik! 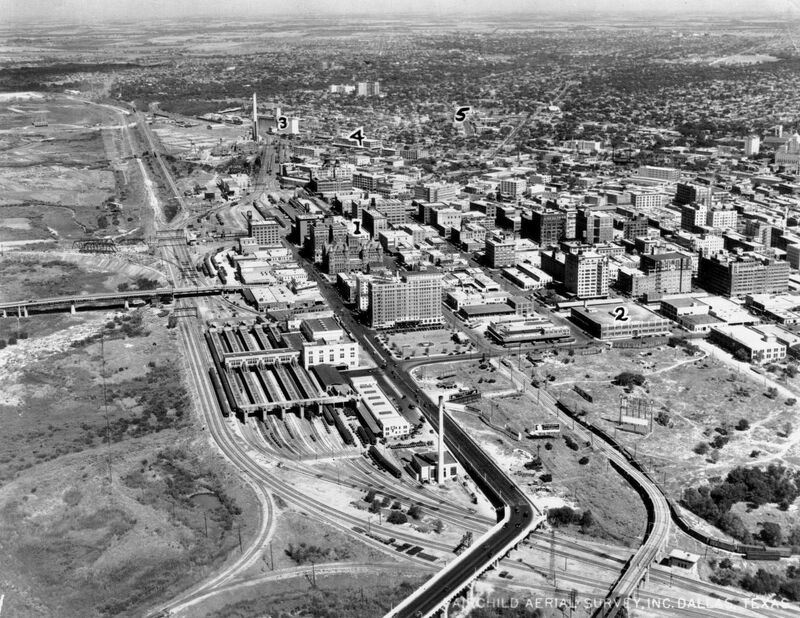 This is a great view, produced by the Fairchild Aerial Survey Co., taken sometime between 1925 (when the Ferris Plaza waiting station was built) and 1934 (when the land between the Trinity and the courthouse began to be cleared to begin construction of the “million-dollar project” which would eventually be known as Dealey Plaza and the Triple Underpass). 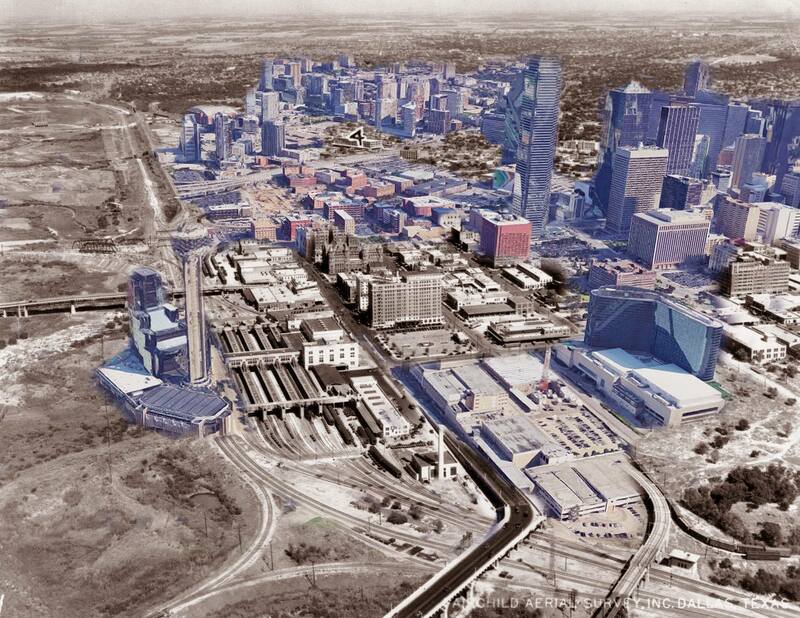 UPDATE: Brian Gunn posted this fantastic now-and-then overlay on the Dallas History Guild Facebook page. I love this. Thank you, Brian! These images are huge. Click ’em! I never heard of the Gill Well growing up — in fact, it wasn’t until around the time I started this blog — about three or four years ago — that I first became aware of it. Though largely forgotten today, the Gill Well used to be a pretty big deal in Dallas: for years, early-20th-century entrepreneurs tried valiantly and persistently to capitalize on the mineral-heavy artesian water from this well — the plan was to use this hot spring water in order to turn Dallas (or at least Oak Lawn) into, well, “the Hot Springs of Texas.” We came so close! 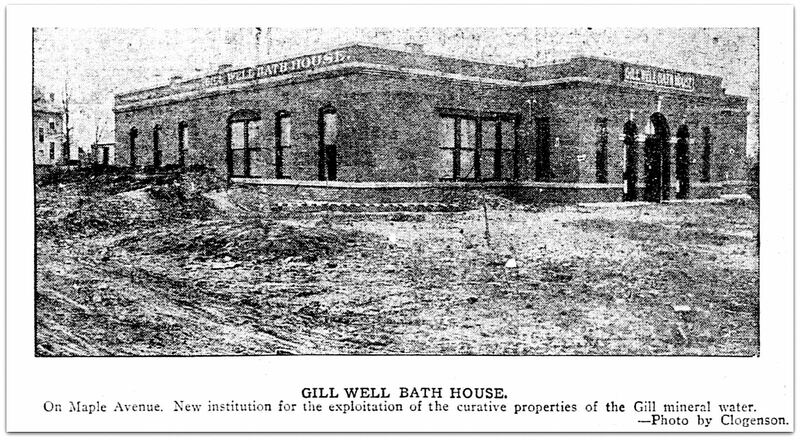 So — Gill Well? Who, what, when, where, why, and how? 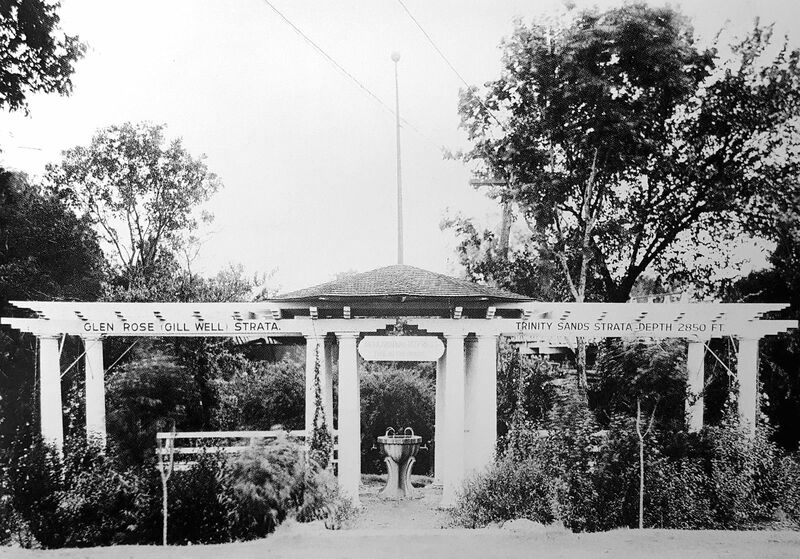 In 1902 city alderman and water commissioner C. A. Gill proposed sinking an artesian well near the Turtle Creek pumping station in order to determine if the flow of water in underground springs was sufficient to augment Dallas’ water supply (there was, at the time, another such test well being drilled in West Dallas). The City Council was on board and wanted this test well to be a deep well, “the deepest in the state — in order to settle once and for all the question as to whether or not there lies beneath the earth in this section a body of water, or ‘an underground sea,’ as some call it, of sufficient size to supply the needs of all the people” (Dallas Morning News, Aug. 6, 1902). The well was sunk in September or October of 1902 near the Turtle Creek pumphouse (which was adjacent to where a later station was built in 1913, the station which has been renovated and is now known as the Sammons Center for the Arts — more on the construction of that 1913 station and a photo of the older pumphouse can be found here); the drilling was slow-going and went on until at least 1904, reaching a depth of more than 2,500 feet. It’s a bit out of my area of expertise, but, basically, good, palatable artesian water from the Paluxy sands — water “free from mineral taint” — was found, but, deeper, a larger reservoir of highly mineralized “Gill water” — from the Glen Rose stratum — was found. That was good news and bad news. The “bad news” came from the fact that a part of a pipe casing became lodged in the well, causing an obstruction in the flow of the “good” water from the Paluxy formation. Again, it’s a bit confusing, but the heavy flow of 99-degree-fahrenheit mineral water (which was corrosive to pipes) threatened to contaminate the “good” Paluxy water … as well as the water from the Woodbine formation from which most (all?) 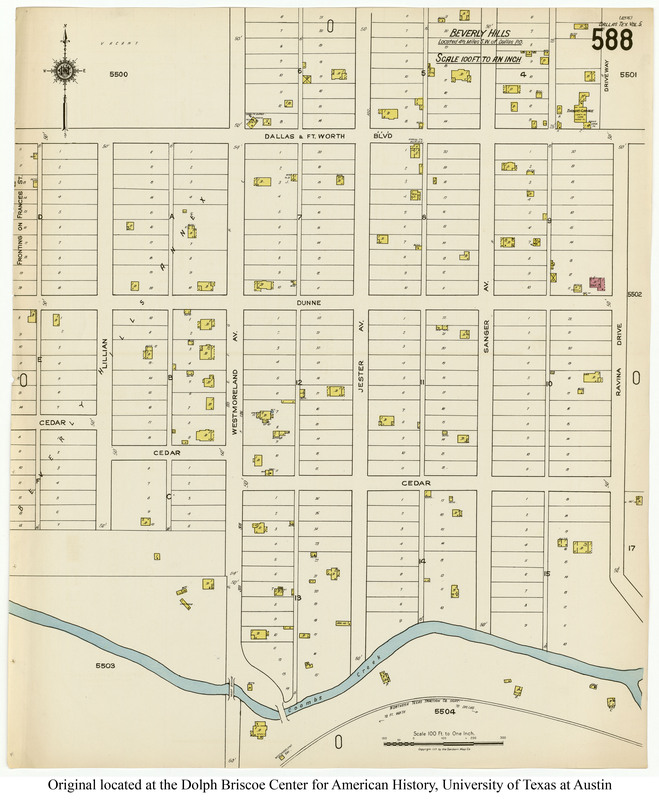 of the private wells in Dallas secured their water. 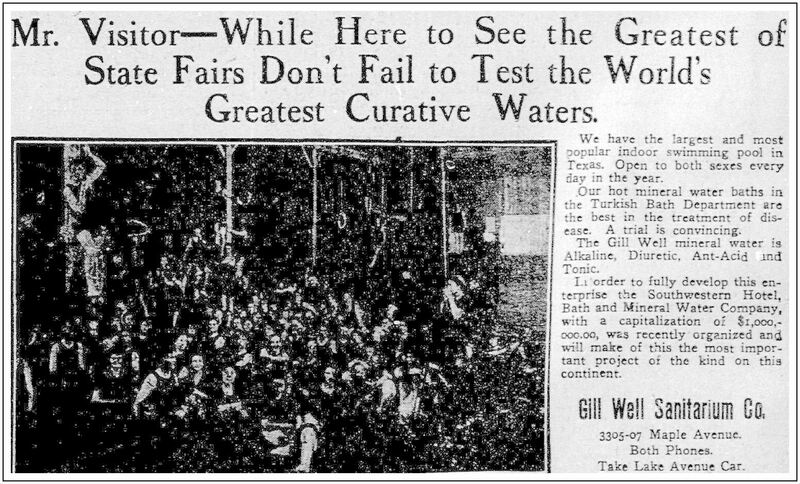 (Read detailed geological reports on the well in a PDF containing contemporaneous newspaper reports here — particular notice should be paid to the comprehensive overview of the well and its problems which was prepared for the Dallas Water Commission by Engineer Jay E. Bacon and published in the city’s newspapers on May 10, 1905). 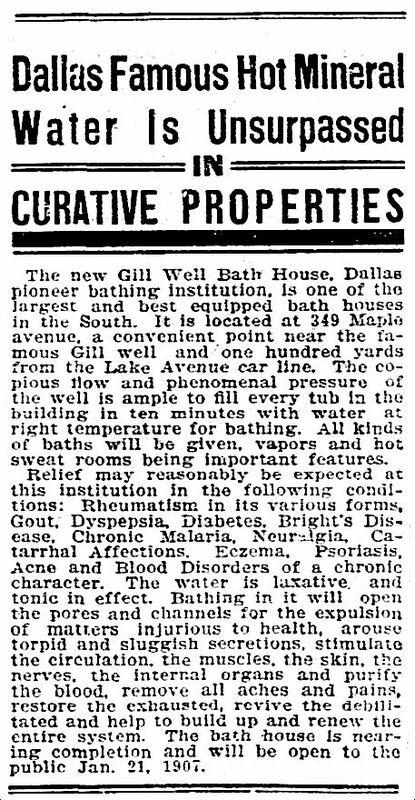 So what the City of Dallas ended up with as a result of this Gill Well was a highly dependable source of hot mineral water. But what to do with it? Monetize it! 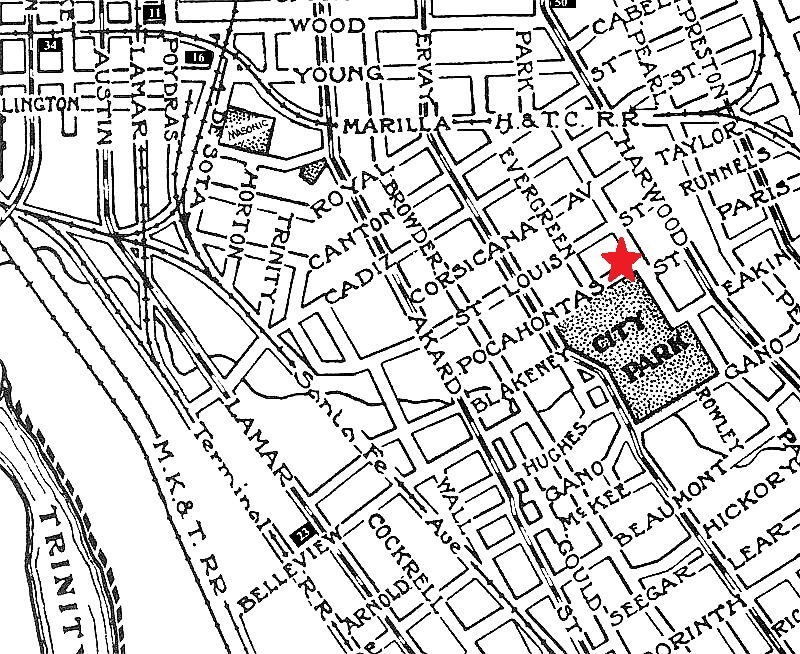 As part of the city’s water supply, the mineral water was made available to Dallas citizens free of charge: just show up at one of the handful of pagoda-covered dispensing stations with a jar, a bucket, or a flask, and fill up with as much of the rather unpleasant-smelling (and apparently quite powerful!) purgative as you could cart home with you. (For those who didn’t want to mingle with the hoi polloi, home delivery was available for a small fee.) One such “pagoda” was erected a short distance away, in front of the city hospital (Old Parkland) at Maple and Oak Lawn (the healthful water was also piped directly into the hospital for patient use). One man, however, began offering the water for sale beyond Dallas, hoping to cash in on the free-flowing tonic (see the mineral-content breakdown here), but the city clamped down on him pretty quickly as he was not an authorized agent. 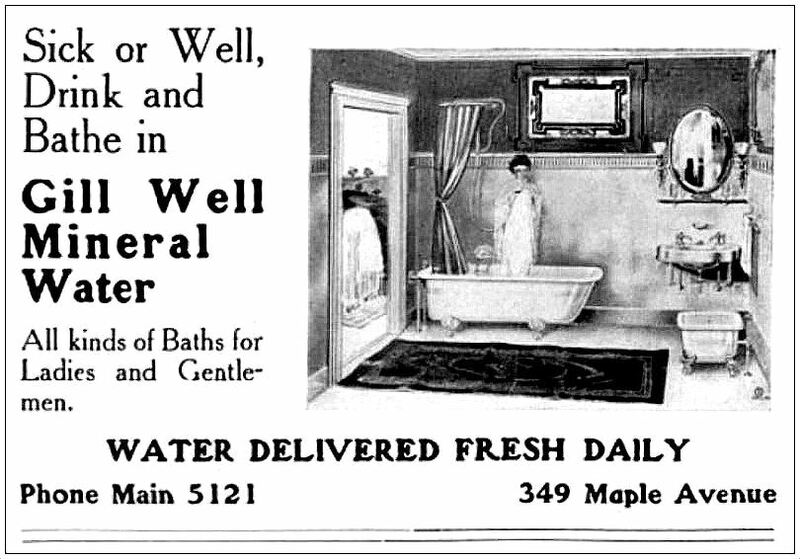 From his 1906 ad, one can see that the reputation of Gill water and its healing and restorative powers was already widely known. Business at the new sanitarium was very good, and the public fountains/spigots at both the sanitarium property and a block or so away at the city hospital continued to be popular with residents who needed a boost or a “cure” and stopped by regularly for a sip or a pail of the free mineral water. 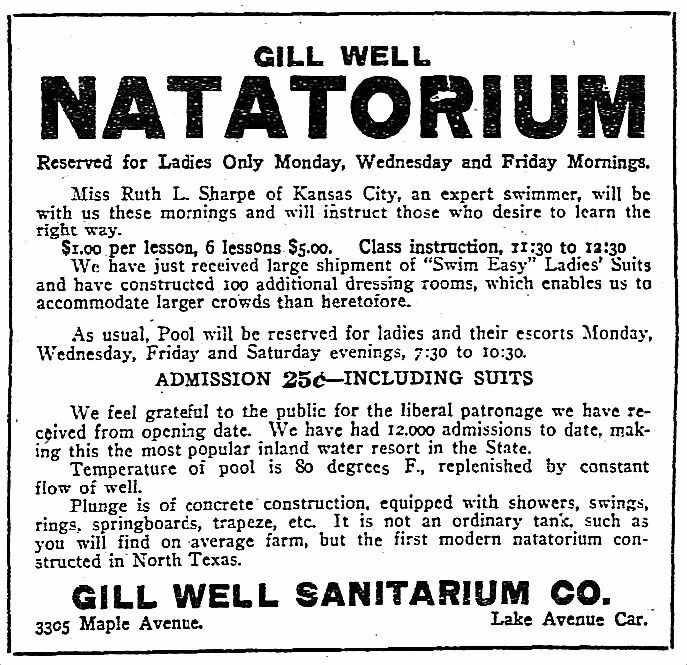 The Gill Well Sanitarium Co. appears to have been dissolved in 1916, but there was still hope that a sanitarium/hot springs resort could continue on the property. 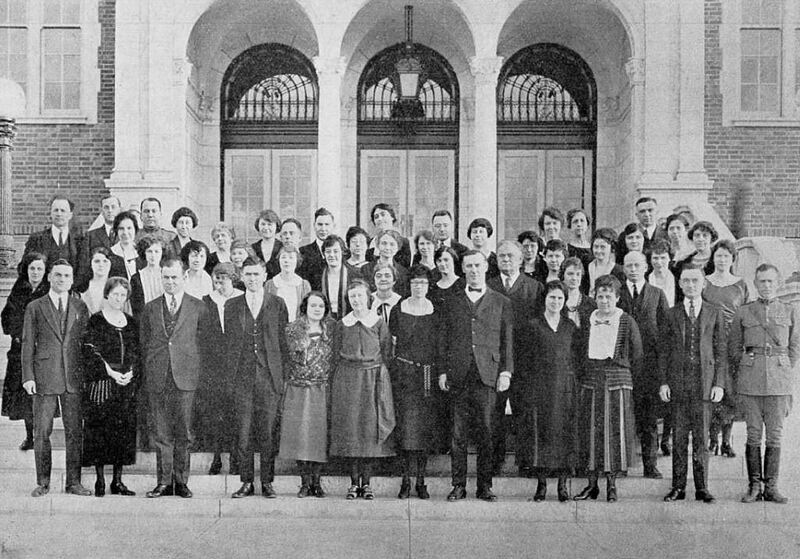 In 1917, interested parties petitioned the city to change its plans to straighten Maple, arguing that it would destroy any ability to do business on the site, but the city went forward with its plans, and in November, 1919, the City of Dallas purchased the land from the group of partners for $21,500 (about $305,000 in today’s money). 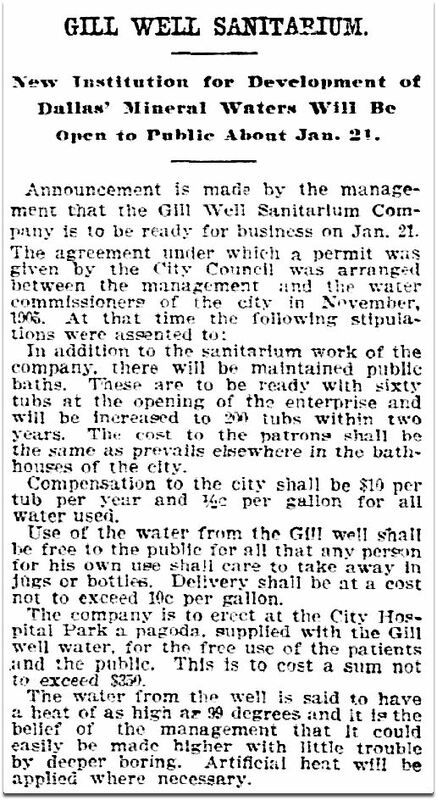 The monetization of water from Dallas’ fabled Gill Well ended after ten years. I had never heard of Maple Avenue being straightened. 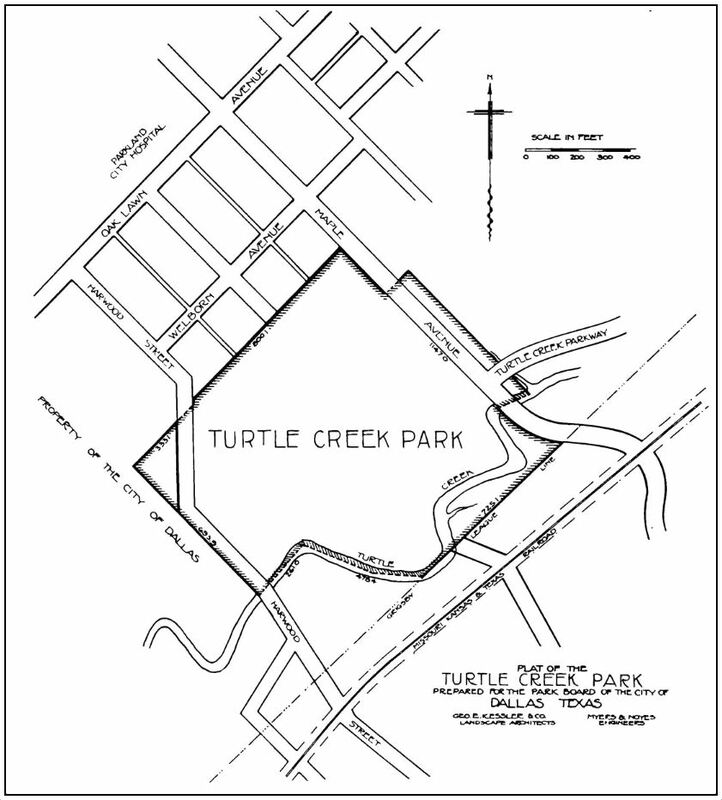 Below is a map of Turtle Creek Park (which became Reverchon Park in 1915), showing Maple’s route, pre-straightening — the main buildings of the sanitarium were in the bulge just west of Maple, between the Katy tracks and the boundary of the park. 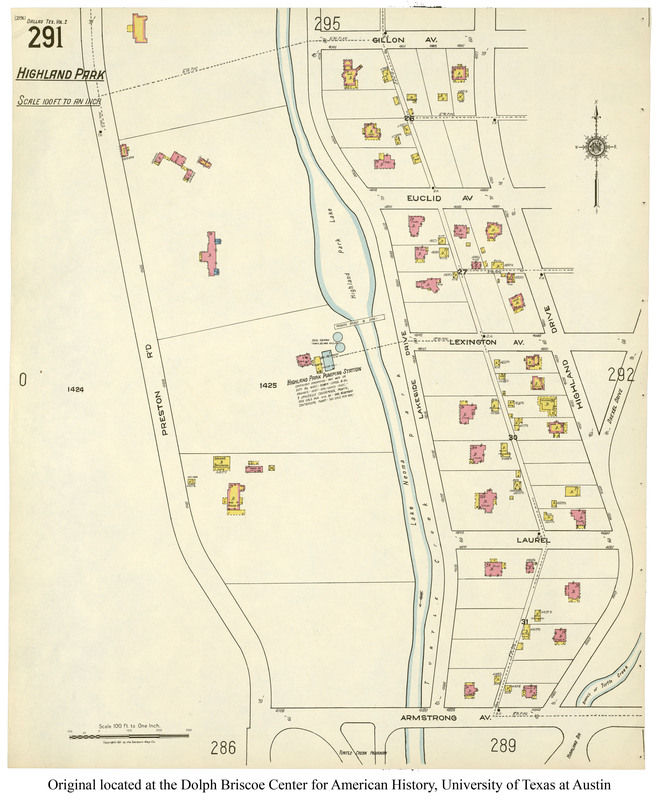 So the Gill Well Sanitarium and Bath House was closed, the land was purchased by the City of Dallas, Maple Avenue was straightened, and, in the summer of 1923, the remaining abandoned buildings on the property were demolished. But that didn’t spell the end of the famous Gill Well water. 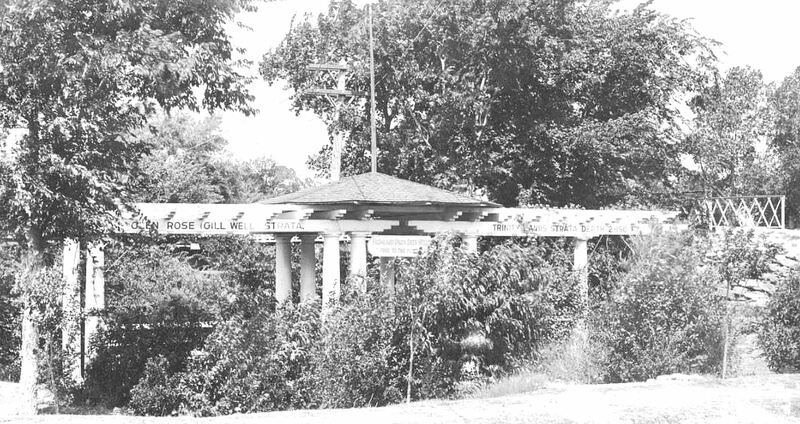 It can be identified as the Highland Park location because of the photo below from the George W. Cook collection of historic Dallas photos from SMU’s DeGolyer Library — it shows what appears to be a later view of the same pagoda, now slightly overgrown. 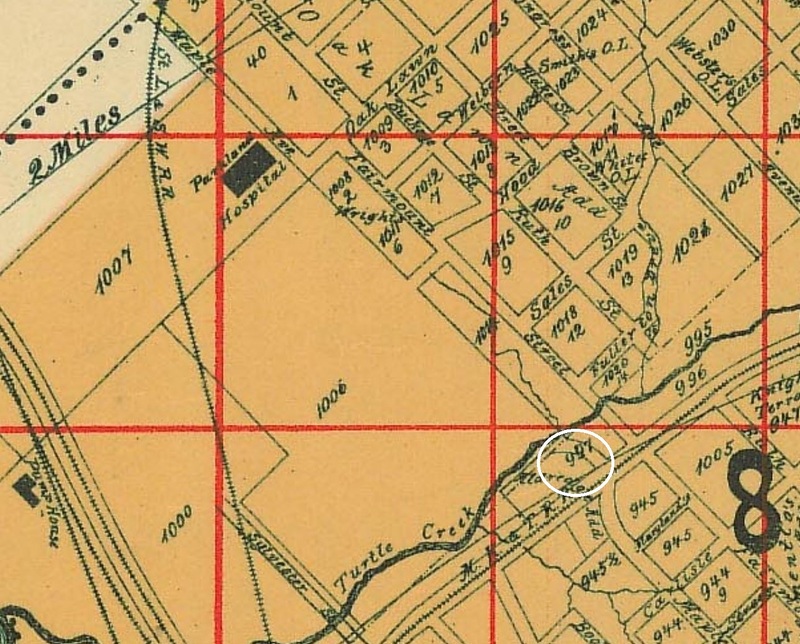 The steps to the bridge across Exall Lake and the bridge’s railing can be seen at the far right (the bridge led to the Highland Park pumping station, which can be seen on a pre-watering-station 1921 Sanborn map here). The water, which resembles in many respects the mineral waters of European resorts and is used in several county and city institutions, is carried to the surface in pipes and can be drawn from taps arranged around a semicircle of masonry near the entrance to the park. Here cars stop at all hours of the day and people alight to drink the water or to fill bottles and pails. I have not been able to find a photograph of that post-sanitarium dispensing site. A 1956-ish aerial photo of Reverchon Park can be found here. I don’t see a “semicircle of masonry” in an area I assume would be located near Maple Avenue and the Katy tracks. According to a comment on the DHS Archives Phorum discussion group, there was also a public spigot nearer to the original well, along Oak Lawn Avenue, across the street from Dal-Hi/P. C. Cobb stadium. There is surprisingly little accurate information on the Gill Well online. I hope this overview helps correct some of the misinformation out there. 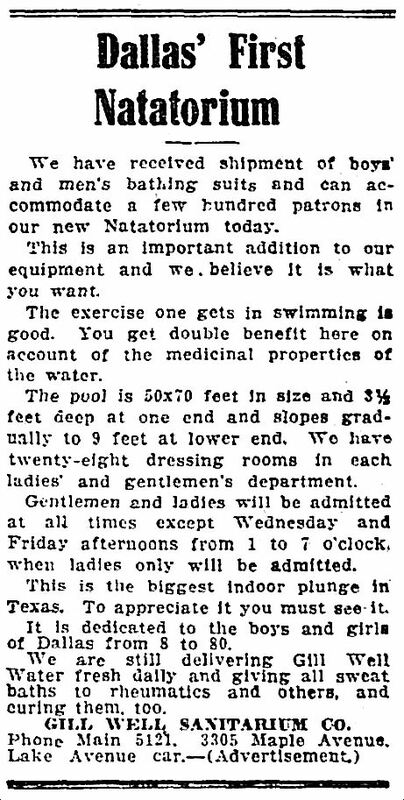 If anyone knows of additional photos of the sanitarium and/or natatorium, please send them my way and I’ll add them to this post. If there are any photos of the Reverchon Park pavilion, I’d love to see those as well. 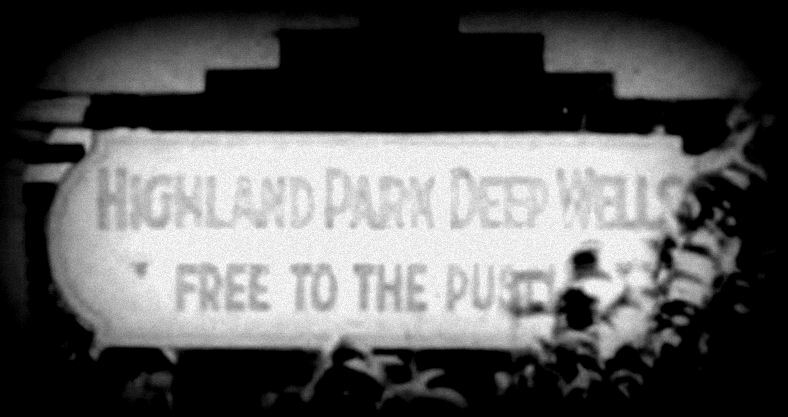 There is a 1926 photo of the Highland Park location which shows two women and two girls filling receptacles — I am unable to post that here, but check the Dallas Morning News archives for the short article “Free Mineral Well Waters Popular” (DMN, May 29, 1926). Incidentally, even though the wells have been capped, that hot mineral water is still there underground and could be tapped at any time. Dallas could still be the “Hot Springs of Texas”! 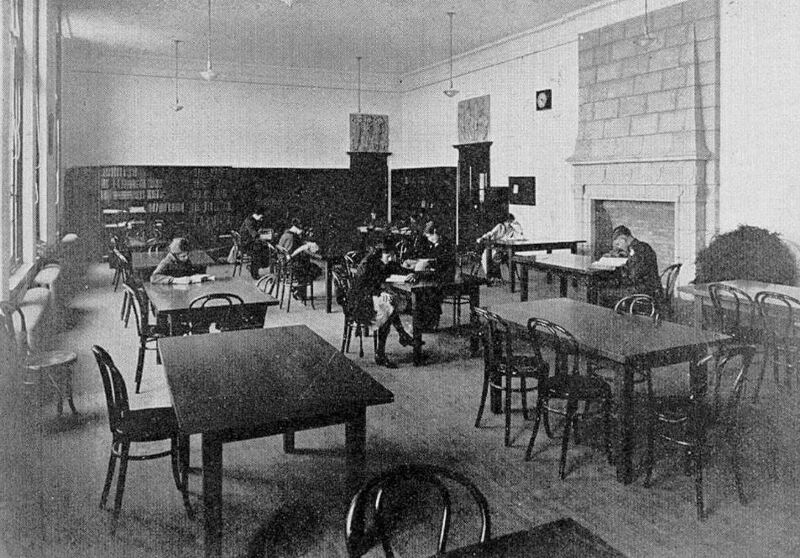 Top photo is from p. 199 of Dallas Rediscovered by William L. McDonald. 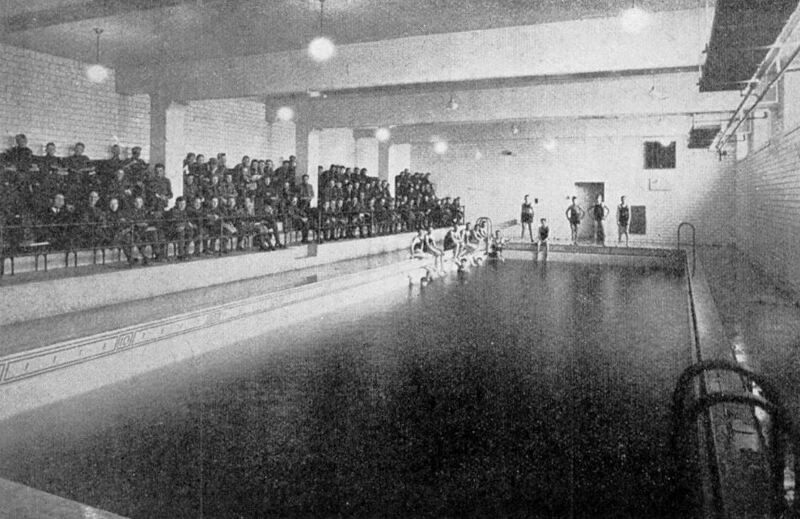 The photo is incorrectly captioned as showing the location of the “Gill Well Bath House and Natatorium, c. 1904” — it is actually the Highland Park dispensing station at Lakeside Drive and Lexington Avenue in about 1928. Photo showing Maple Avenue, pre-straightening, is from the Big D History Facebook page; original source of photo is unknown. Second photo of the Highland Park Gill Well location (with the vegetation looking a bit more overgrown) is from a postcard captioned “Drinking Bogoda [sic], deep mineral well in Highland Park, Dallas, Texas” — it is from the George W. Cook Dallas/Texas Image Collection, DeGolyer Library, Central University Libraries, Southern Methodist University; more information on this image is here. 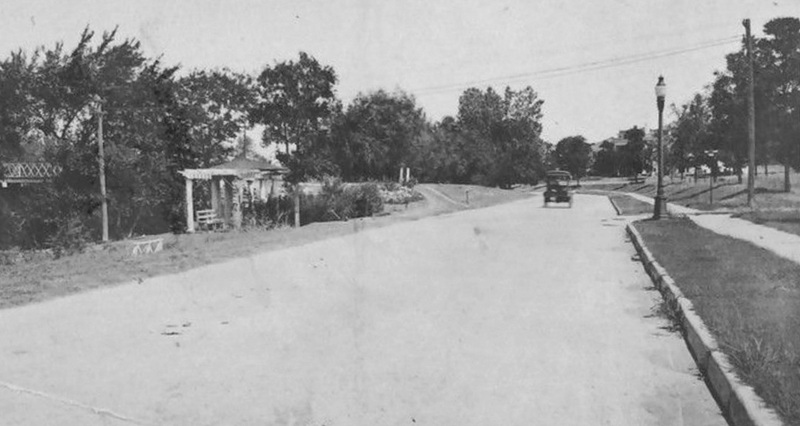 Photo showing Lakeside Drive with the pagoda at the left is a real photo postcard captioned “Lake Side Drive in Highland Park” — it was offered last year on eBay. 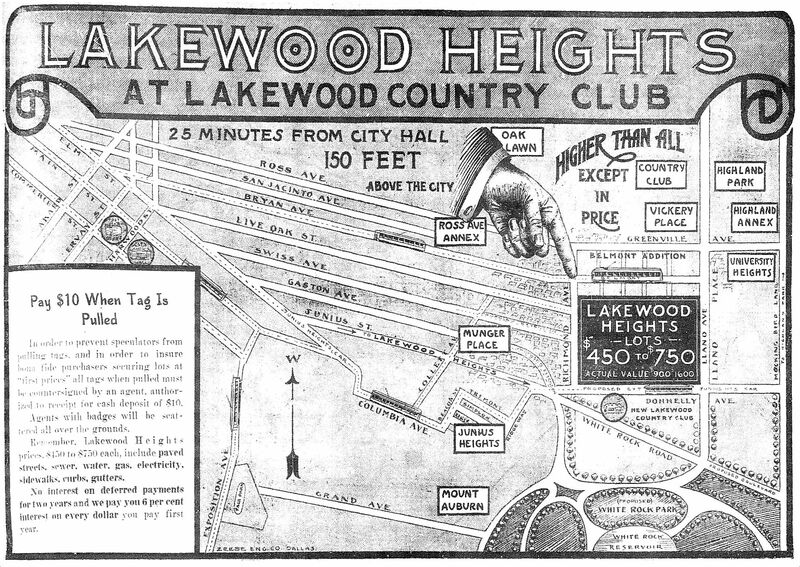 Sources of all other clippings, ads, and maps as noted. Industrial Dallas, Inc. was a nonprofit corporation formed by directors of the Dallas Chamber of Commerce to boost national awareness of Dallas’ favorable business climate and its role as a major hub of business and manufacturing in Texas and in the neighboring states Oklahoma, Arkansas, and Louisiana. 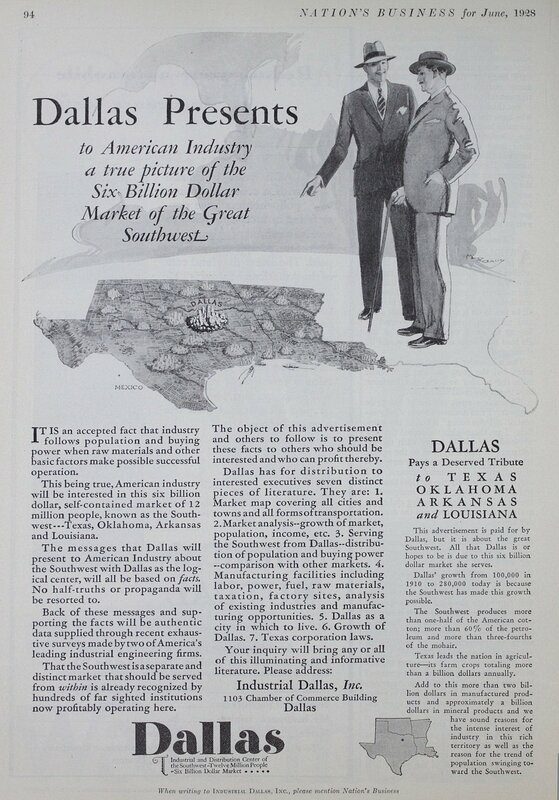 The idea was to promote Dallas in a series of advertisements placed in national business-oriented magazines; the three-year campaign (1928-1931) had a budget of $500,000 (the equivalent of $7,000,000 in today’s money) and was led by banker and Dallas booster (and future mayor) R. L. Thornton. 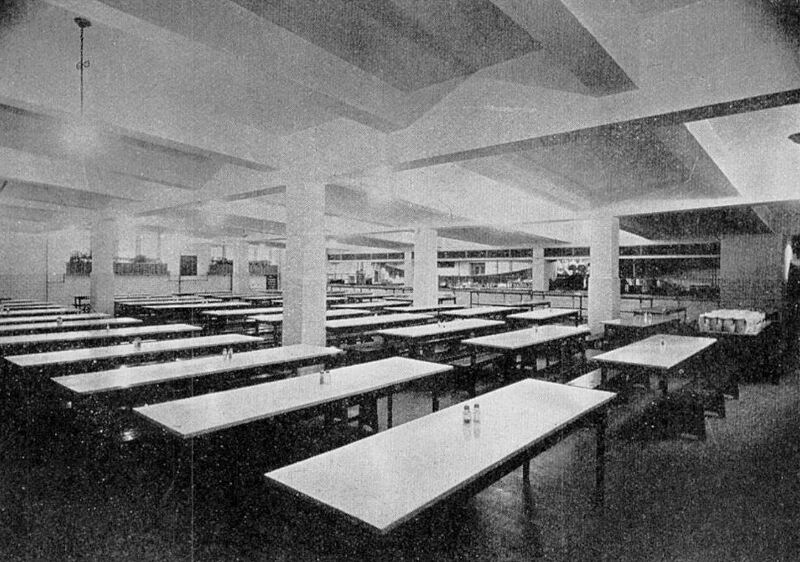 Despite the fact that this campaign coincided with the first years of the Great Depression, Industrial Dallas, Inc. was considered a success: it attracted hundreds of new companies to Dallas and firmly established the city’s national reputation as an important commercial center and as a dynamic young city offering limitless business opportunities. Not everyone was smitten with these Dallas ads, however. 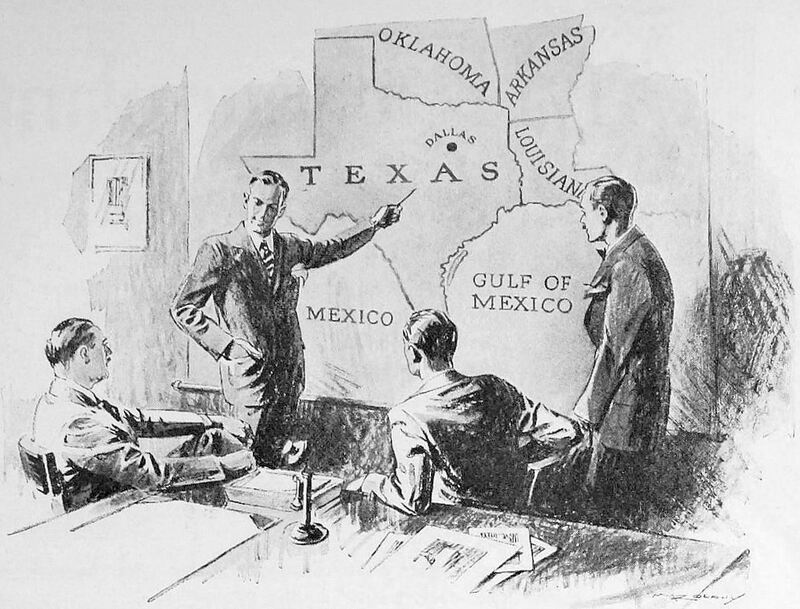 Texans who did business beyond the “acceptable” concentric circles of the Dallas, Inc. map were annoyed, as can be seen in this amusing piece by a writer for the Waco newspaper (click to see larger image). 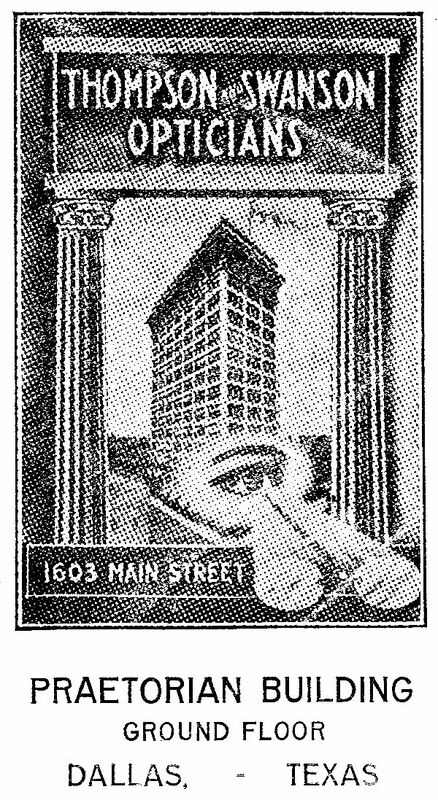 Two Industrial Dallas, Inc. ads appeared it the June 5, 1928 issue of the magazine Nation’s Business (the top illustration is a detail, the second is a full-page advertisement). 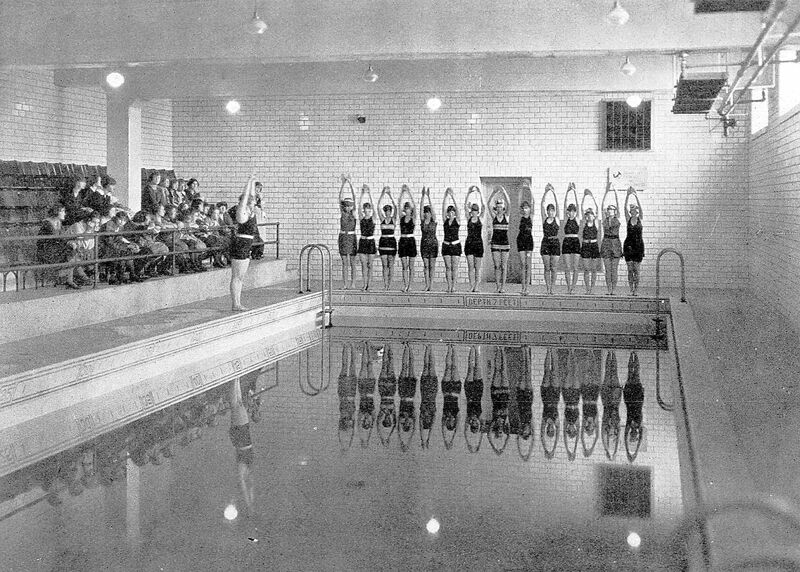 The ads were intended to run only three years — until spring of 1931 — but they continued to run until at least the very beginning of 1932. 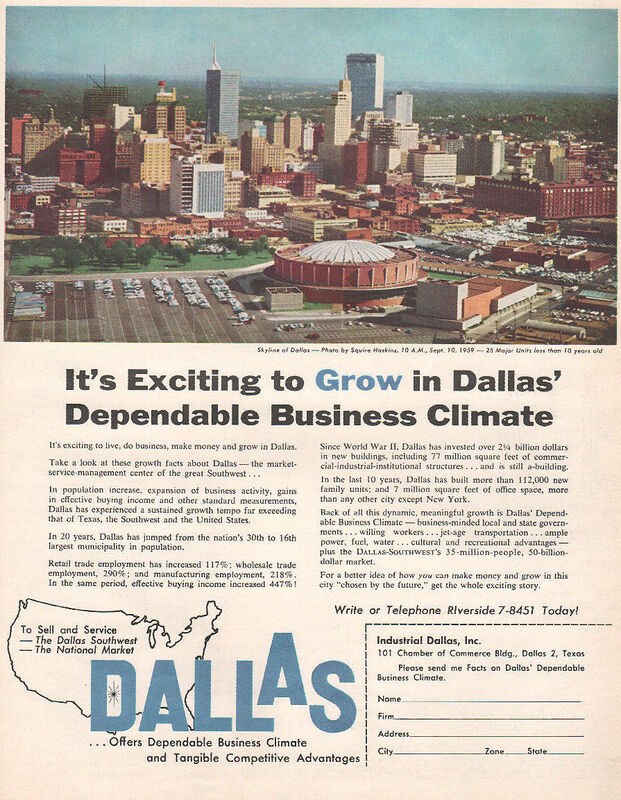 In 1959, Industrial Dallas, Inc. was resurrected for another publicity blitz (led by Dallas Power & Light president C. A. Tatum, Jr.), and ads again appeared in national publications for three years. One of this later series of ads can be seen here. An interesting little sidebar about this campaign was that it was expressly credited with attracting the Firestone Tire and Rubber Co. to build a new “Master Super Service Station” at the northwest corner of Ross and Harwood in 1929 as part of the company’s multi-million-dollar national expansion program. The company purchased what was then the home of the Knights of Columbus, but it had been known since its construction around 1900 as the grand Conway residence, a palatial house designed by architect H. A. Overbeck for prominent lumber dealer J. C. Conway (it was the childhood home of his daughter Gordon Conway, a noted fashion illustrator). It was reported that after the Firestone Co. purchased the property, Harvey Firestone, Jr. had two carved mahogany mantels removed from the house and shipped to the home he was building “in the North.” It’s sad that such a lovely home (seen here) — not even 30 years old! — would be torn down to build a service station. But time and tide wait for no man. Especially in Dallas. I come across a lot of interesting Texas photos that have nothing to do with Dallas, so I think I might, on occasion, post them here, knowing that someone else is also likely to find them interesting. Like the one above. This photo is from the incredible gift that just keeps giving, the George W. Cook Dallas/Texas Image Collection, held by the DeGolyer Library at SMU. Most of the items in the collection have a Dallas connection, but there are several others of general Texas interest. 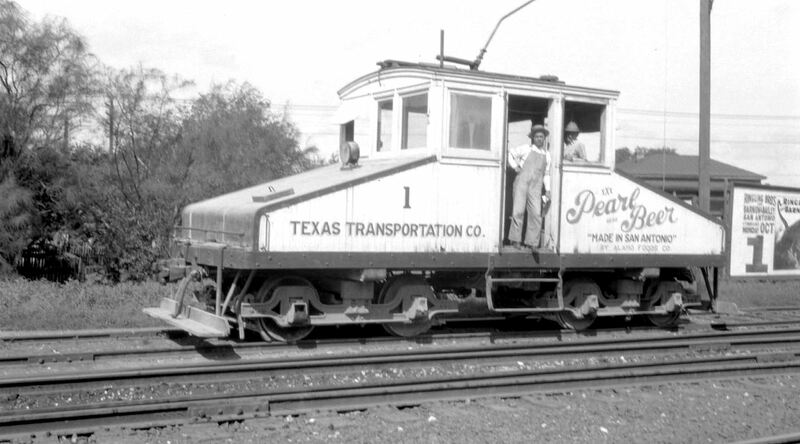 Here’s a later photo of the locomotive (October, 1928), now emblazoned with the Pearl Beer logo. Top photo — titled “T. T. Co. No. 1. Texas Transportation Co.” — is from the George W. Cook Dallas/Texas Image Collection, DeGolyer Library, Central University Libraries, Southern Methodist Unviersity; more information about this photo can be found here. Second photo — titled “Texas Transportation Co. locomotive, engine number 1, engine type Electric” — is from the Otto C. Perry Memorial Collection of Railroad Photographs, Western History Department, Denver Public Library; more information on this photo can be found here. A great short, illustrated history of the Texas Transportation Co. and the various locomotives that ran on its rails can be found at the Don Ross Group website, here (be sure to read the reminiscences of a man who worked at the Pearl Brewery as a college student in 1960 at the bottom of the page).